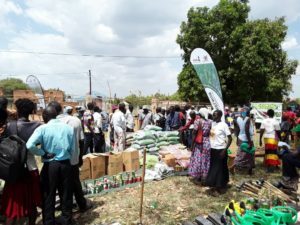 A recently released weather forecast report by Uganda National Metrological Authority (UNMA) has left dozens of small-scale commercial farmers in Acholi sub region confused. According to the report released on February 25, rain was expected in the districts of Gulu, Nwoya, Lamwo, Kitgum and Arua by mid- March. Like other districts in Central Northern parts of Uganda including Gulu, the first major rainfall season is expected to be between early April and Mid- May. The report further indicates that region is currently experiencing isolated light showers which are expected to continue up to mid- March when the onset of the seasonal rains is expected to get established. Overall, the report says near normal rainfall is expected over this region. Meteorologists observed and predicted atmosphere-ocean conditions in the Indian and Pacific Oceans with implications of moisture transport and distribution of rainfall in the region. However, by March 25, farmers said they have seen even a single drop rain. Instead, according to the farmers, temperature has been steadily climbing in the last one week from 30 degree celcious to 35 degree celcious by Monday. Denis Komakech, a maize farmer in Pedi village in Amuru Sub County, Amuru district said the long dry spell has left him frustrated. Komakech says he is stuck with maize seeds in his store after opening 20- acre piece of land. He noted that he started sensing change in weather pattern in 2017. He adds that his hope of rainy season setting soon has dashed considering that the fact that meteorologists report has turned not to be accurate. Another farmer, James Okiya, says the unpredictable weather has forced him to abandon his farm. Okiya says he had planned to open 26 acres to plant rice, banana, watermelon, groundnuts, maize and cassava but he has since suspended the plan. Okiya, a resident of Lamaja in Paicho Sub County, Gulu district adds that he was able to open only 7-acres of the over 20- acre piece of land because the soil has become is hard to cultivate due to harsh weather condition. Michael Megolonyo, a local farmer in Acholi-Nyek village in Lalogi Sub County, Omoro district decried the lack of accurate information on weather and said it makes it risky to start even opening land. Megolonyo says majority of farmers in the rural areas always rely heavily on local radio stations for weather updates but sometimes they get disappointed since it turns out to be unreliable. By now, farmers especially who have planted maize should be doing the first weeding, according to Megalonyo. The Gulu Resident District Commissioner (RDC), Major Santos Okot Lapolo says the sudden change in rainfall pattern is worrying. Lapolo explained that with farming in Acholi sub region being rain fed, if it does not rain soon, there could be danger. Lapolo who himself is a small- scale farmer said this could be the longest dry spell he has ever witnessed. In 2017, Gulu recorded the highest temperature in the country in the month of February, according to a report released by Metrological department. The weather report indicates that the average extreme maximum temperatures were recorded at Gulu weather station was 35.8 degrees centigrade. The report further indicates that the highest of daily maximum temperature extremes recorded at Gulu weather station was 36.7 degrees centigrade. Meanwhile Kabale weather station was lowest at 28.0 degrees centigrade. Recently environmental experts in Acholi have warned that the rising temperature is due to accumulation of greenhouse gases in the atmosphere and indiscriminate tree cutting.